In November, 1918 Helga Sandburg was born in Elmhurst, Illinois just outside of Chicago. 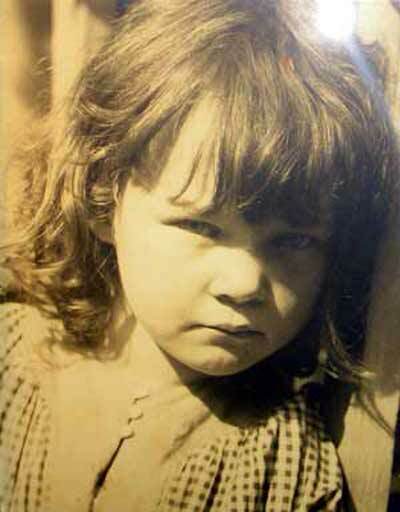 She was the last child of Carl Sandburg and Lillian Steichen. Her father re-named her mother, Paula, and it is the name she used from then on. Helga joined sisters Margaret (ten years older) and Janet (five years older) in the family. Her father had nicknames for them as well: Soink and Skabootch. Later, Helga would be nicknamed Swipes. She never really knew the origin of the nicknames and it never mattered. These were names of love and endearment. Even her father's name, Carl, was not his given name. He was actually Charles, but that was a name Paula did not like and he became Carl. 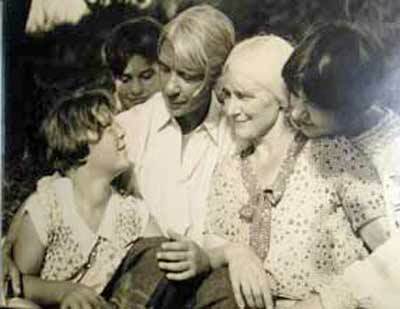 Carl Sandburg's need to travel was deep in his soul so he spent much time away from Helga and the family as she was growing up. In fact he was in Scandinavia when his daughter Helga was born. He writes about the special event of her birth in his poem "Home Thoughts". It was through her Uncle that Helga was able to meet such characters as Charlie Chaplin. As her father became more and more famous she met more and more well known faces and personalities through him. Among some of Ed's photographs were Lillian Gish in her role in Ophelia and John Barrymore as Hamlet. 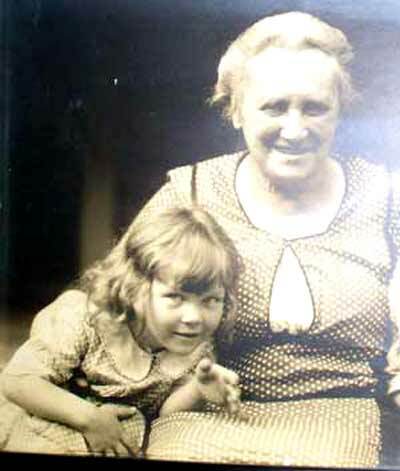 In 1921 when Helga was only 3, her sister Margaret contracted epilepsy and had frequent and often violent seizures. "Remember this was many years ago and medicine has come quite far since then." Margaret became quite a reader or as Helga described her "a bookworm." Helga has wonderful memories of her childhood, like making dandelion or Concord grape wine with her mother and grandmother (Oma). 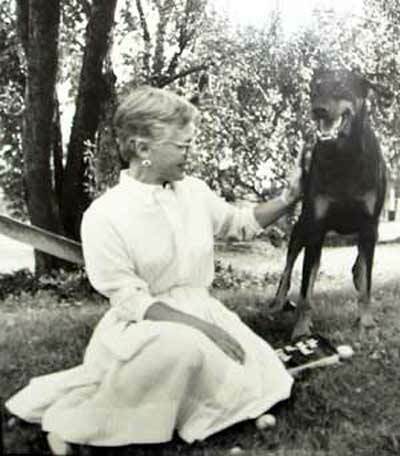 Possibly the most re-occurring memory of all, however, is her association with animals. 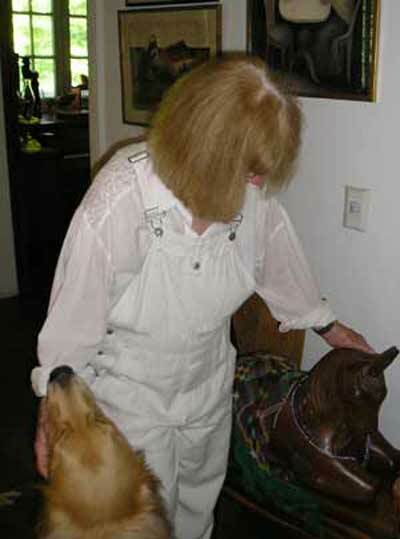 Rabbits, kittens, puppies, horses; it didn't matter what kind of animal; she was intrinsically drawn to them. As a shy child the animals most likely "gave me an outlet". 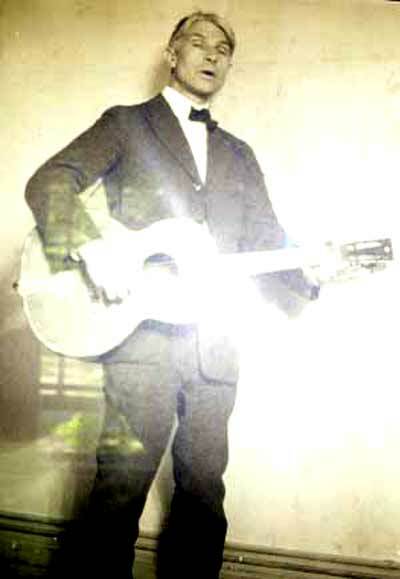 Many nights after dinner Carl would read to the children and often sing and play his guitar. "There was a guitar in the house at all times - I can't remember a time when there was not." 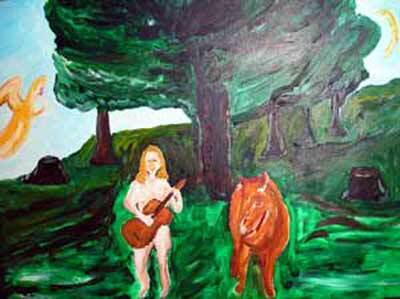 Helga, too, plays the guitar and has it prominently placed on the wall in her home. She loved the music and the poems her father set to melody so much that she has written a number of songbooks including "Sweet Music: a book of family reminiscence and song". Helga also plays piano. When Helga was about 8 the family bought a summer cottage on Lake Michigan, which they named "Wren Cottage". She remembers long walks with her father and singing around a beach fire. They had such wonderful times there that eventually the family purchased a five acre lot a few miles from the beach that Carl named Paw Paw Patch. Helga and her father corresponded whenever he was out of town on his travels. 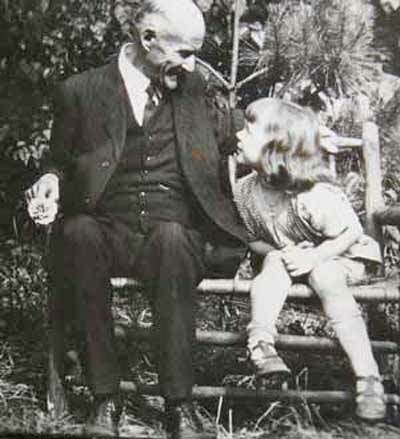 He once sent her a book autographed by Henry Ford and shared his correspondences with Helen Keller with Helga. There was also an abundance of correspondence with Franklin Delano Roosevelt whom her father compared (favorably) to Abraham Lincoln. A young woman by the name of Martha came to live with them around 1930 to help with the cooking and cleaning and household chores. Helga loved Martha, immediately accepting her as part of the family. In the spring of 1935 Helga, age 16, started High School. The family bought even more land around Paw Paw Patch with the intention of growing a garden. Helga was thrilled. The idea of vegetables and fruits coming from the earth both intrigued and excited her. With the extra land came some extra animals too, but not enough to satisfy Helga. She wanted a cow. Instead of a cow however, her mother bought three goats and the two of them took to raising goats as if they were born to do just that. They named the tool shed where they raised the goats the "Tom Thumb Dairy". "I liked knowing that the animals needed me and depended on me and that I could take care of them." Eventually they took the goat raising to a new level and received certification on Advanced Milk Production for what was now "The Chikaming Goat Farm". "Even my father helped milk the goats at times." But Helga always watched to make sure it was done properly and completely. Her mother became a member of the Board of Directors of the American Milk Goat Record Association and started taking the goats to fairs. Helga and her mother were so proud of their goats and the blue ribbons they won. During this time spent at state fairs Helga started to discover boys and "I was quite happy with the discovery." Helga refers to her young loves (and the many handsome, charismatic men she meets and loves in the future) as Lochinvars, as written about by Sir Walter Scott in the very early 1800's. It may or may not have been this discovery, but something inside Helga screamed for independence and time away. So she decided to go to college and headed off to stay in the dorm at Michigan State. She soon left and transferred to the University of Chicago where she was closer to home and could visit more regularly. On one of these trips home, while helping her mother at a fair, Helga met the man who she would soon run away and marry, Joe. Joe also was to become the father of her two children. Her first child, Joseph Carl (Carl called him John) was born December 4, 1941. Three days later Pearl Harbor was attacked and the country was at war. Helga and Joe moved to the St. Louis countryside where they planted fruits and vegetables and raised cows, pigs and, of course, goats. Soon after, Helga became pregnant with her daughter, Karlen Paula. (Carl called her Snick) Joe enlisted in the Seabees and not long after his return he and Helga were divorced. The family moved to Flat Rock North Carolina and Helga went along with them. The new house was called Connemara because the last owner was Irish and missed his homeland. 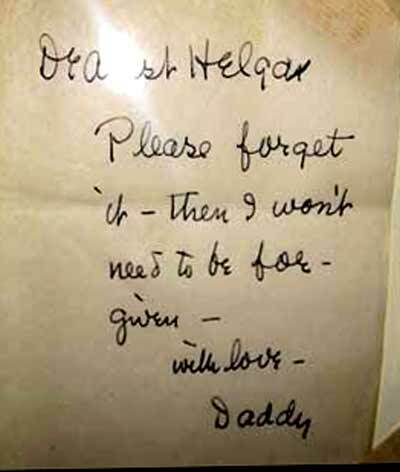 During all of this time Helga handled all of her father's paper work and correspondence and much of the paper work for her mother. By age 27 Helga was traveling, writing poetry, writing stories and painting. She traveled to New York City at least once a year spending her time with people like Pete Seeger, Alan & Elizabeth Lomax, Eric Sevareid and cartoonist C.D. Batchelor. In 1950 Helga married again, a man by the name of Art. Around the same time she went to work for the government as a clerk typist at the Library of Commerce. Art and Carl did not get along well - and a rift was created between Helga and her father. Eventually Helga and Art divorced and she and her father reconciled. "I loved my father even during the rift. My father was always my sweetie." In the meantime Helga was writing more and more. Her father, when he finally read what she wrote, was thrilled with her talent. "Writing is such a personal experience; everyone goes about it in their own way." 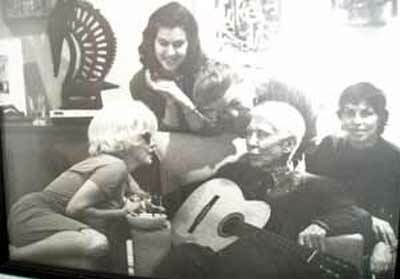 Helga's father, Carl Sandburg, died in 1967 at age 89, a loss Helga still feels today. "My father was larger than life and such a tremendous influence. Everything centered around my father and his needs. Oh and he was so good with children. I'm really not very good with children, but my father always was." Her mother lived until 1976 (age 93) and her beloved Uncle Edward died at age 94 in 1973. Helga kept a journal throughout the 60's; "a wonderful time of free love and excitement." She is planning on publishing the journal, when her schedule permits, but "time is so elusive, I don't know if I'll get to it. I think I really should try though. The sixties were so freeing." Helga feels fortunate to have been part of a generation that was able to experience so much with so little concerns. "Of course everything changed when things like AIDS came about." Helga met George "Barney" Crile at a time when he was still mourning the death of his wife, Jane Halle Crile. Kay Halle invited her to meet him and the chemistry was instant. But Helga didn't want a special relationship. She was living in Washington and had a man there and in Chicago and on the west coast. She wanted one in Cleveland too and Barney would be perfect. She told him she was interested in enjoying his company, but not marrying him. Even as she spoke the words she knew their relationship was different and Helga would not be able to ignore that for long. 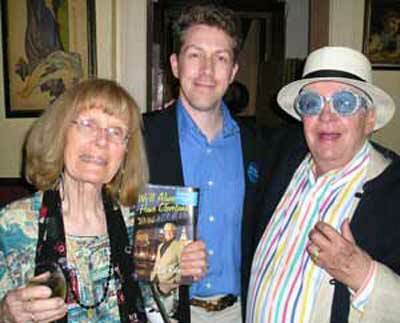 He asked her to come to Cleveland and edit a book he and Jane had done together, and she did. 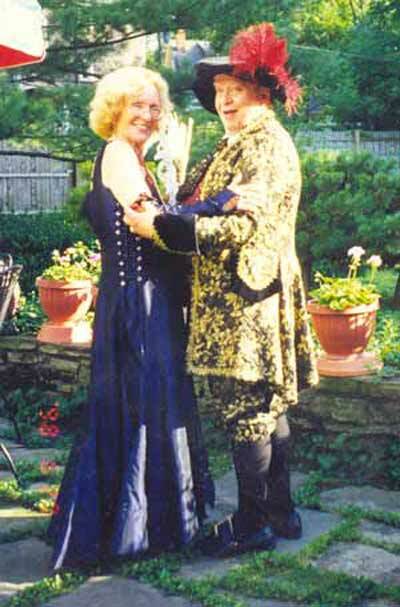 Then they were married. Both George and Jane Crile were surgeons at the Cleveland Clinic, founded by George's father. She and Barney had a wonderful life traveling the world together and just spending time with one another. They went scuba diving and on archeological digs, both passions of Crile. They even had their own film festival every December, showing films of their lives to all of their friends. "We had such a wonderful time. It was always an adventure to be with Barney." 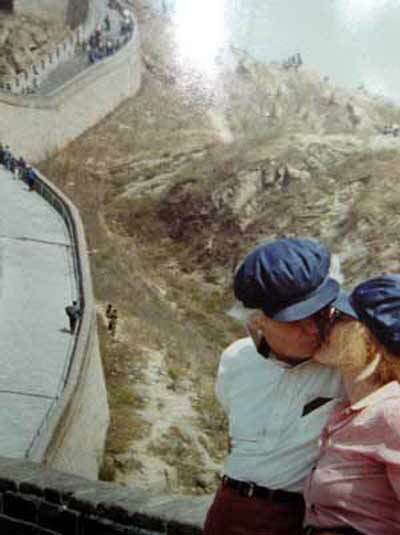 She remembers near the end of his life, when he was told he had only 3 to 6 months to live. "The people at Cleveland Clinic really wanted him to live to see the opening of the Crile Center - such a wonderful memorial." "I still talk to his ashes. The wonderful thing about death is that it can't take away memories." Helga has a deep faith in God and feels strongly that putting your fate in His hands is not only wise, but necessary. "You have to trust in God in all things." Helga says she inherited her love of the earth from her mother and misses the opportunity to get her hands dirty more often. From the very beginning Helga loved the gardens; seeing the world in bloom was very special to her. 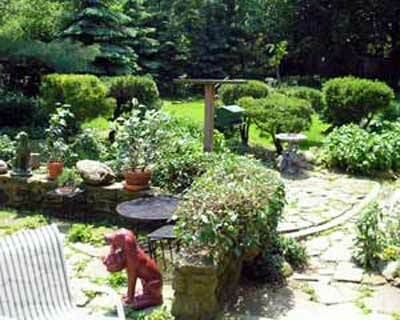 Today in her Cleveland Heights home her garden is superb with bright hibiscus and deep green trees. From her father she inherited her love and music and writing and of "adventures". 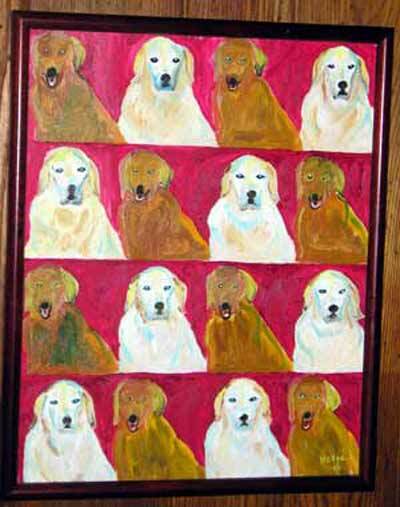 Her love of animals has not waned either, although goats and horses have been replaced by a wonderful Golden Retriever named Mickey. "I always knew how special my father was and had a problem with myself in that area. I was shy - I still am shy. It was not easy for me to take over my own life." Helga's father is quoted as telling Edward R. Murrow, "I'd rather be known as a man who says What I need mainly is three things in life, possibly four: to be out of jail, to eat regular, to get what I write printed and then a little love at home and a little outside." Helga would rather different people to remember her in different ways. "I hope some remember me as a wonderful lover, but others would not know that and I would like each to remember me as quite good in whatever role I played in their life." Carl Sandburg College (Galesburg, Illinois, Carl's hometown) holds a three day festival each year - The Sandburg Days Festival. Helga attends each year. In 1978 she and her husband, established the Lillian Steichen Sandburg Memorial Scholarship in honor of her mother. Helga was given an honorary degree from the college in 1979. Helga does not attend funerals or weddings. None. Speaking of the death of a dear friend she says that every morning a beautiful red cardinal comes to her in the garden and asks "Is Betty here?" When she "hears" the cardinal ask about Betty she says, "Betty is always with me. There was no reason to go to her funeral." There is no one Helga Sandburg. She is the youngest daughter of America's favorite poet. She is an author and a poetess, a painter and a gardener. She is a simple woman with many complex layers. She has surrounded herself with beauty and beams with a natural beauty of her own. She is as comfortable with goats as she is with royalty. And she believes strongly in God. Helga Sandburg is a delightful woman who brings a unique history and perspective to the table, but is more anxious to hear your story than tell her own. It is difficult to talk to her without feeling a little better. She will make you think and test your philosophical awareness: all by pointing out a beautiful flower or showing you the goat statue standing in her living room. You don't know it's happening, but somehow she is taking you to another level of thought. And you are glad to go there with her.